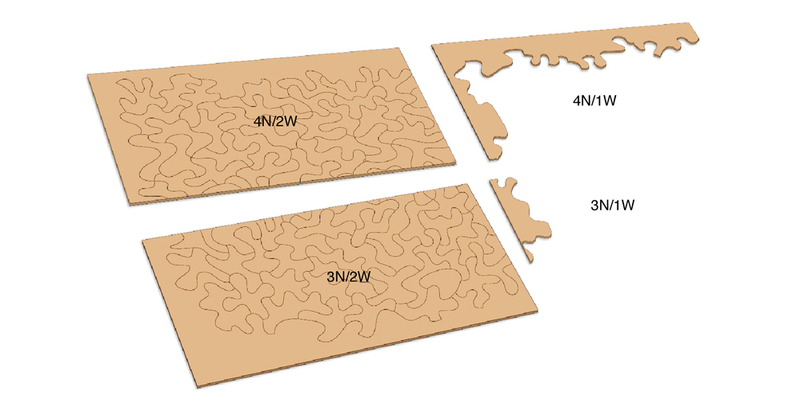 When new sheets of plywood are added, the pieces that cross the unglued edges must be left uncut. No edge can be cut until it is glued. Consequently the entire uncut perimeter is kept in storage. A) The borders adjacent to the new plywood are brought from storage and prepared to be glued. B) Edges are glued creating a continuous joint which can now be cut. C) All the pieces that don't cross the edge are cut out. The new pieces are then divided into groups in a variety of sizes. D) Each group is then treated as an individual piece of artwork.